I’ve been reading a lot of young adult novels recently: The Hunger Games Trilogy and Sarah Dessen books. One of my good friends is giving me a hard time about it. Well, maybe because i’m not technically a young adult anymore but I say, what the heck?! I like young adult novels because I’m a late bloomer. It’s just that I now appreciate it better because when I was a young adult I was busy experiencing young adult stuff like peer pressure and other melodramatic angsty stuff teenagers go through. 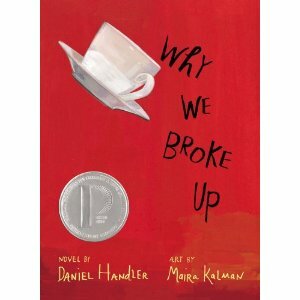 Anywho, I just finished my first book for my 2013 book challenge – Why We Broke Up by Daniel Handler. I know that we shouldn’t judge a book by it’s cover but I must admit it’s a factor in choosing a book especially if you don’t have a particular book in mind. It was cheap for a hard bound book plus it had some cute illustrations and the font were big so I guess that’s why I bought it. Why We Broke Up is a story about Min Green and why she broke up with her boyfriend Ed Slaterton. Min loves movies and she wanted to be a director. Unlike typical high school girls Min was different because, well, I guess, she’s got more substance. In the book, she was often referred to as “arty”. Ed, on the other hand, was this typical high school jock. Co-captain of the basketball team. Good looking dude who’s really not in Min’s league, to put it bluntly. In the story, Min was writing a letter for Ed and she’s on her way to bring Ed a box containing random items: notes, bottle caps, movie tickets, maps drawn on table napkins, rose petals, toy truck, and a whole lot of random things that may have contributed to the break up. Every item connected to a specific moment in their relationship that made them both fall in and fall out of love. Either way, all of it led to the reason why they broke up. I’m gonna give it 3 BOOKMARKS (I would have given it 3 stars but I want it to be different. Haha!). I liked it. I think that most people could relate because I, for one, loooove keeping stuff for sentimental reasons. I mean, how many candy wrappers, table napkins from restaurants, or movie tickets have you kept? Be honest! 🙂 The story was a bit predictable. I mean, even Min said that their relationship was doomed from the beginning. Why is that, you ask? Well, it’s not that Min is not pretty but guys like Ed, the popular high school kids, are superficial. They’re in relationships not because they want somebody to talk to after a long day or because of those emotional satisfaction that we all need from romantic relationships. High school boys, like Ed, are into scoring hoops and scoring girls. Although, Ed did try and made an effort but sometimes your just too different that love is not enough. Especially for those two teenagers. I guess, opposites attracting is not always the case. I think, you have to have at least 1 thing in common (aside from the common fact that you like/love each other) because if you’re too different, you just won’t get each other and it just wouldn’t work out.